Chain dimensions, and therefore the gypsies that will accept them, vary considerably according to whether they are made to imperial or metric standards and even between manufacturers. European made chain is to DIN 766 and/or ISO4565 and most European gypsies will accept it. There is a strange anomaly that has caught out many owners. The dimensions of the two standards are identical for all chain sizes except 10 mm, in which the link length is 2 mm different. The gypsy should be marked in some way to identify to which standard it conforms. Suppliers normally proof test chain to between 40% and 50% of the rated Minimum Break Load (MBL), whereas the quoted Safe Working Load (SWL) is 25% of the MBL. Note that many other standards exist for short link non-marine chain whose dimensions are different. Chain to these standards will not fit any gypsies. American chain is made mainly to ISO G30 and G43 standards with longer links that may not fit European gypsies. Note that the dimensions of these two grades are not the same. G43 (Grade 40) is more widely used for anchor rodes in USA. The strength of the finished chain is determined by the composition and treatment of the steel used for its manufacture. 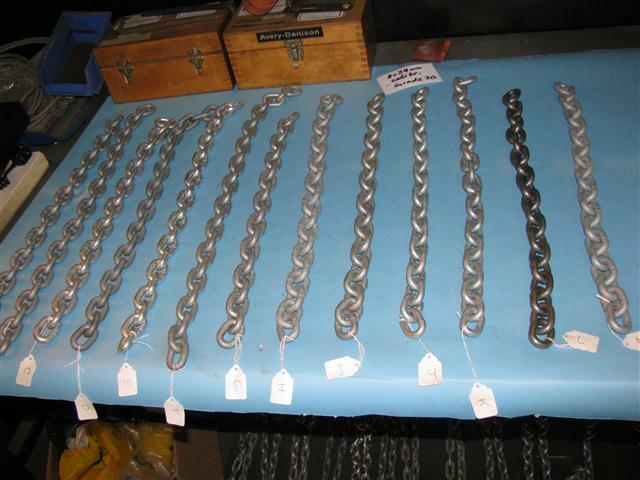 Marine chain with the lowest strength is Grade 30, made from low carbon steel such as DIN 10301 (EU) SAE 1008 (US). For Grade 40 the carbon and manganese contents are increased, giving about a 25% increase in strength, but without heat treatment. This steel is typically DIN 1.1133 (EU) SAE 1022 (US). 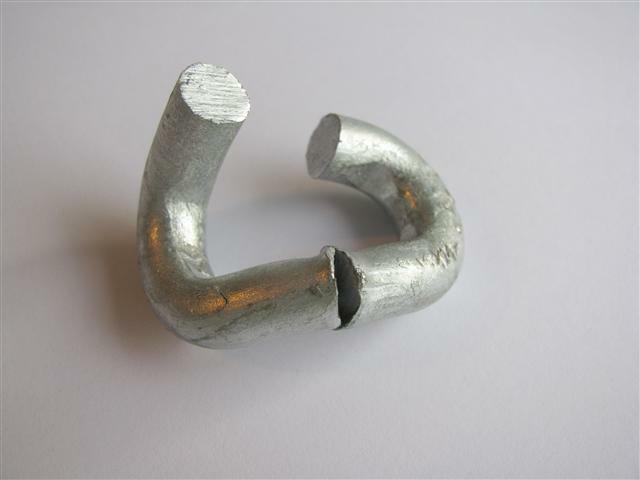 These grades may be galvanized without concerns over strength reduction. Grade 70 chain is manufactured from the same steel as Grade 40 but it is heat treated to increase strength by a further 20%. There is a risk that re-galvanising this grade could induce hydrogen embrittlement, which would weaken it. Any owner contemplating re-galvanising this grade is advised to seek expert advice before going ahead. The major benefit in going to higher grades is that the weight of chain being carried can be reduced for no reduction in strength. A batch of 13 samples prepared for testing. Three samples of each 8 mm chain were tested. A sample showing signs of extension under load in the tensile testing machine. 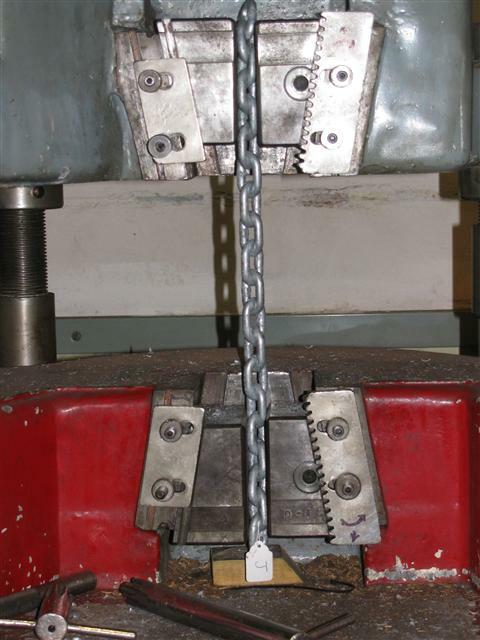 A total of 13 chain samples was tested destructively using a 50 ton Denison tensile tester. The samples included several made in Europe but the majority were from Chinese factories. Four were Grade 40, nine were Grade 30. Every sample achieved the required strength for its grade but it was noticeable that every Chinese Grade 30 chain, with one exception, delivered the strength of a Grade 40. The result suggests that steels used for Grade 40, typical of constructional steels, are more readily obtainable in China than the lower carbon steel used for Grade 30. The only failure recorded occurred at a faulty weld. 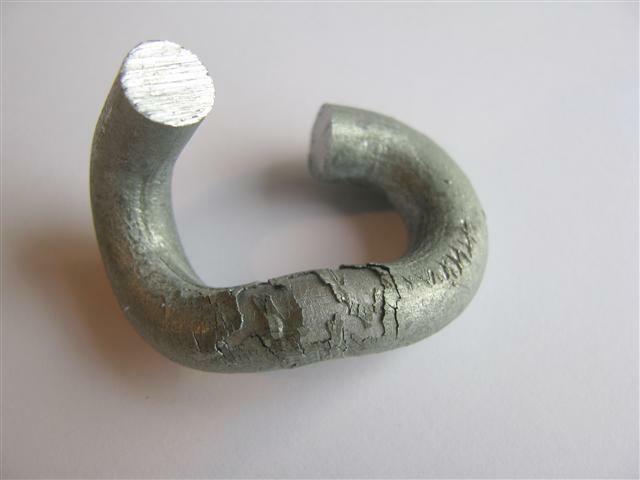 A simple test was devised that was found to replicate the failure and also showed the condition of the galvanising in a manner very similar to that of the tensile tests. 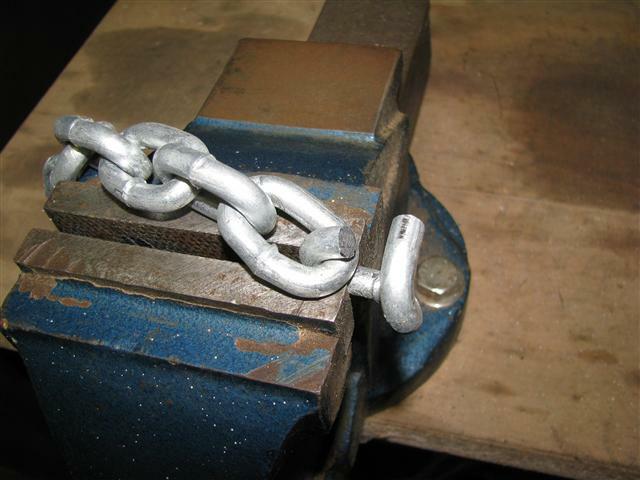 A single link of chain is clamped in a vice with the weld down. Using a hacksaw the link is cut on the side opposite to the weld. The link is then levered open by about 90 degrees using an adjustable spanner. A link of chain in a vice with the weld facing down. The unusually short and protruding welds can be seen. Defective weld on the only chain to fail tensile testing. All welds on this sample were noticeably short, indicating incomplete welding. Poorly adhered galvanising.On many samples the galvanising remained fully intact after the same treatment. Force (in kg force) = (1/500) x (LOA in metres squared) x (wind speed in knots squared). This equation gives a rode load of 90 kg force for my boat in 20 knots of wind, which seems to be a realistic value.